Modigliani, arguably the leading figure in the expressionist movement in Paris, is world famous for his portrait art - largely inspired by African sculpture - and for his female nudes, which caused a huge scandal at the time. Just as he was making a name for himself among collectors of modern art, he died of tuberculosis. The expressionist portraits for which he is famous were all produced in the five-year period between 1915 and the artist's early death in January 1920. Apart from four landscapes, Modigliani's output of painting consists entirely of female nudes and portraits, all characterized by seemingly primitive and elongated forms. The portrait of Juan Gris was painted during the First World War. German artists had left Paris and all French artists of military age had been conscripted. Montparnasse, the principal artists' quarter of Paris, was populated only by a handful of artists from non-belligerent countries. In 1915 Pablo Picasso and Juan Gris, both Spanish and both well-known Cubist painters, sat for the Italian, Modigliani. Although Modigliani had been acquainted with both artists for almost ten years, he had, until this time, kept his distance from them. They were Cubists, and Modigliani had insisted on maintaining his independence from schools and groups, particularly from the modern artists of the so-called Ecole de Paris that gathered around Picasso. By 1915, however, Modigliani's style was sufficiently mature for him to assimilate the rich and varied influences of the Parisian art world without compromising his own individual method of working. The onset of war meant another profound change for Modigliani. Before 1914 he had worked principally as a sculptor, producing carved heads and figures whose slender elegance owed much to the tribal art of Africa and the Oceanic art of the Pacific. When war broke out, however, stone became scarce and too expensive for the far-from-wealthy Modigliani. Building projects were halted, and the sites from which the artist had customarily scrounged his blocks of stone had all but disappeared. 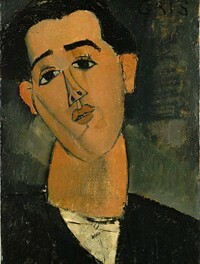 In 1914, therefore, Modigliani abandoned sculpture and focused his attention on painting. The portrait of Juan Gris was probably painted at a single sitting - Modigliani seldom required more than two. Over the years he had kept himself alive by making quick portrait sketches at cafe tables, often for a few sous and a drink. In paintings such as this one, his speed of execution captured the freshness and immediacy of his perception, but the thinness of the paint is explained by economy of a more prosaic kind - Modigliani was always hard-up. The head and the cylindrical neck in Juan Gris look carved, in a way that recalls not only Modigliani's sculpture but also the African carvings he so much admired. The nose in this picture, like the noses in many African masks, is stated almost as a separate feature. Otherwise, the subtle organization of the face into separate planes is Cubist in origin and reminds the viewer that this is the portrait of a prominent Cubist painter. It was in about 1915 that Modigliani adopted the practice of inscribing portraits with the names of sitters in bold lettering. His inscriptions are invariably humorous, sometimes pointed, and always fitting. At the top right of this picture is the sitter's name, GRIS, which means 'grey' in both Spanish and French. Neutral grey tones had for centuries been associated with the art of Spain; more recently, these tones had characterized the paintings of the Cubists. And here, Modigliani has written the word across the neutral grey background of his own picture. See also Modigliani's Portrait of Jeanne Hebuterne (1918).  For the meaning of other works of French expressionism, see: Homepage.